New Year’s Eve. A bit like Marmite – some people hate it, some people like it. I’m definitely in the latter category. I like all the cosiness Christmas brings, but I’m not a fan of the stodgy food that we traditionally eat in Scandinavia, so New Year’s is for me the perfect opportunity to cook and eat food I really like. Food worthy to end the year. The last few years I’ve spent the evening with my closest friends and we have worked out the perfect New Year’s Eve menu, for us at least. 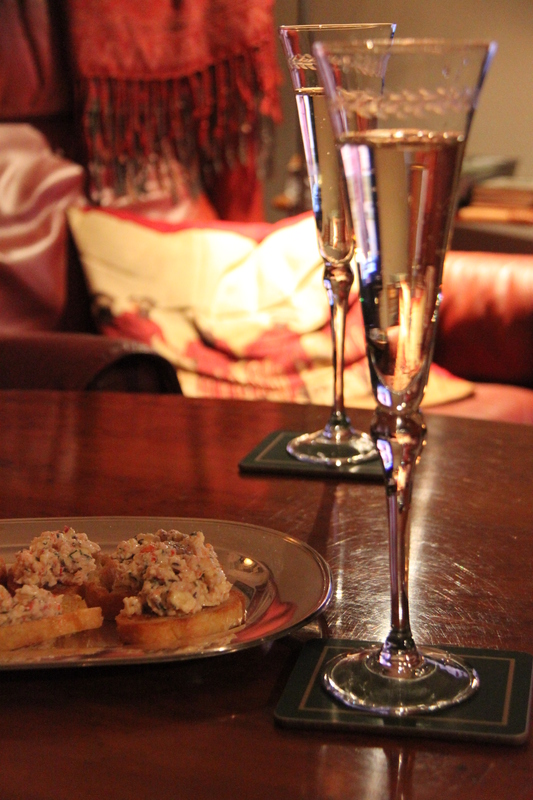 We start off with champagne, Swedish Kalix (bleak) roe, butter-fried bread, creme fraiche and chopped red onion., with champagne. It’s the most simple thing – yet incredibly delicious (and very Scandi!). Next we have lobster, usually with melted garlic butter, and this year I opted for caramelised garlic butter – another simple and delicious dish! For mains we usually have fillet of beef, with potatoes and greens. This year the beef fillet was served with mini Pommes Anna (made in a muffin tin), mange tout and a mushroom sauce with Dijon mustard. For pudding we had individual chocolate pavlovas with chocolate crème and creme fraiche (whipped cream would be better but I forgot it), decorated with daim and Noblesse chocolate thins. A jug of chocolate sauce was put on the table so everyone could help themselves. The day before (or at least a few hours ahead of) serving: Wrap the garlic in tin foil and bake for 40 mins in 180C oven (until soft). Leave to cool. Mix the butter with as much caramelized garlic you like. It’s sweeter and not as strong as fresh garlic, so I thought 5 cloves was a good amount. Chop the parsley and mix in. Add pepper too. Roll into a roll and cover with cling. Place in the fridge to set. To serve: Cut the lobsters in half lengthways, remove the gooey bits in the head and the bowel string. Rinse the shell with the meat still inside. Crack the claws and get the meat out. Place in the shells and place the shells in an ovenproof dish. 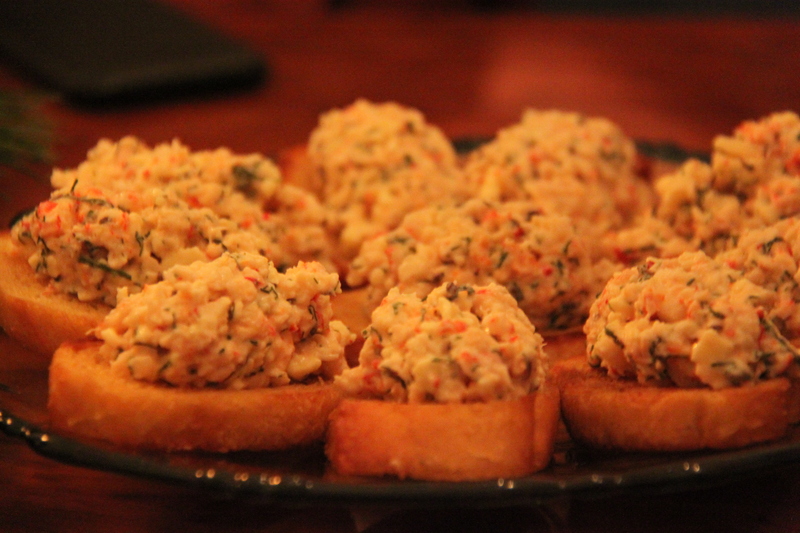 Cut the butter into thick slices and distribute on the lobster halves. Place in 180C oven for approx 10 mins until the lobsters are hot and the butter has melted. Serve immediately with a piece of lemon and a slice of baguette. Adapted from Bon Appetit’s recipe. Preheat oven to 180°C . Melt butter in a small saucepan over medium heat. Brush 8-10 wholes in the muffin tin all over with butter. Line bottoms with parchment-paper rounds. Arrange 1-2 small thyme sprigs in center of each round. Drizzle 1/2 teaspoon butter into bottom of each cup. Add chopped thyme and garlic to remaining butter in saucepan. Stir over medium-low heat until fragrant, about 2 minutes. Remove from heat. Using food processor, moulinex or mandoline, slice potatoes crosswise into very thin rounds , placing them in a large bowl as you work. Pour herb butter over and season with salt and pepper; toss to coat well. Divide potato slices among muffin cups, layering overlapping slices to create a circular pattern. Lightly press center of each to make compact. Drizzle any remaining butter and seasoning from bowl over. Cover muffin pan tightly with foil and place in the oven. Bake until potatoes can be pierced easily with the tip of a knife and are golden brown, about 35 minutes. Remove foil; invert a rimmed baking sheet over pan. Turn, lightly tapping on counter, releasing potatoes onto sheet. Rearrange any slices that may have fallen out. Discard parchment. Translated from and Adapted after Roy Fares’ recipe. Chocolate cream: Chop the chocolate and place in a bowl. Mix egg yolks, sugar, corn starch and vanilla in another bowl. Bring the milk to the boil in a saucepan and mix it into the egg yolk mixture (little by little as to not scramble the eggs). Pour the egg yolk milk mixture into the saucepan on medium heat, stirring constantly, until the mixture has thickened. Cook for another 2 minutes, on low heat, to get rid of the corn starch flavour. Pour the custard over the chocolate, add the butter and mix until the chocolate has melted. Cover with cling and place in fridge until cold. Pavlovas: Chop the chocolate and place in a bowl, melt either over boiling water or in the microwave. Pre-heat oven to 150C. Beat the egg whites until foamy and add the sugar bit by it while beating until stiff and glossy. Add the corn flour and vinegar and mix carefully with a spatula. Drizzle with the melted chocolate and create a marbled effect by folding the mixture 2-3 times with a spatula. Divide the meringue mixture into four small rounds on a lined baking tray. Bake in the middle of the oven for 60 minutes. Turn the oven off and leave the meringues in the oven while cooling. Let the meringue discs cool completely. Chocolate sauce: Mix sugar, cocoa and cream in a saucepan. Bring to the boil. Let the mixture simmer for 3-5 minutes. Leave to cool completely. Assembling: Place a meringue disc on each plate. Fill up with the crème and top with whipped cream. Decorate with daim, noblesse and sparklers. Heat up the sauce and serve it in a jug on the side. The Swedish equivalent to Eton mess is marängsuisse; a pudding consisting of ice cream, meringues, whipped cream and chocolate sauce. You can also add berries, nuts, bananas or anything else you want. I like to serve the ingredients separately so people can assemble their own. 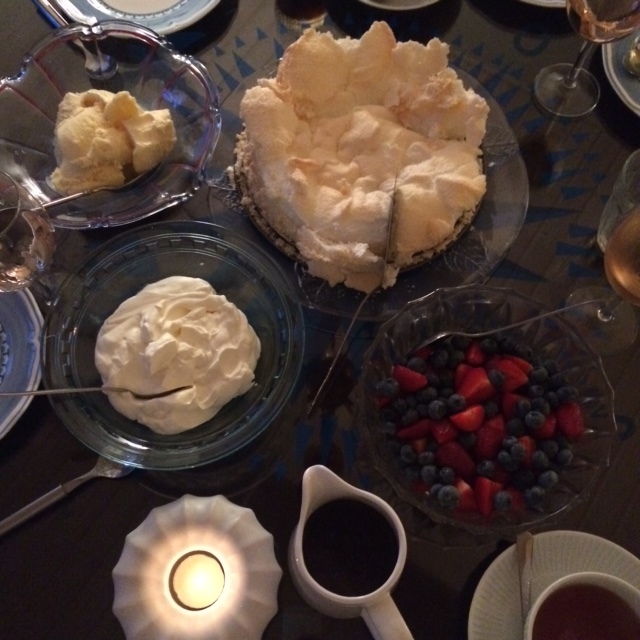 Last time I made this I tried a new type of meringue that my food blogger friend Charlotta had posted on her blog a while ago; a lovely gooey meringue that completely melts in your mouth. 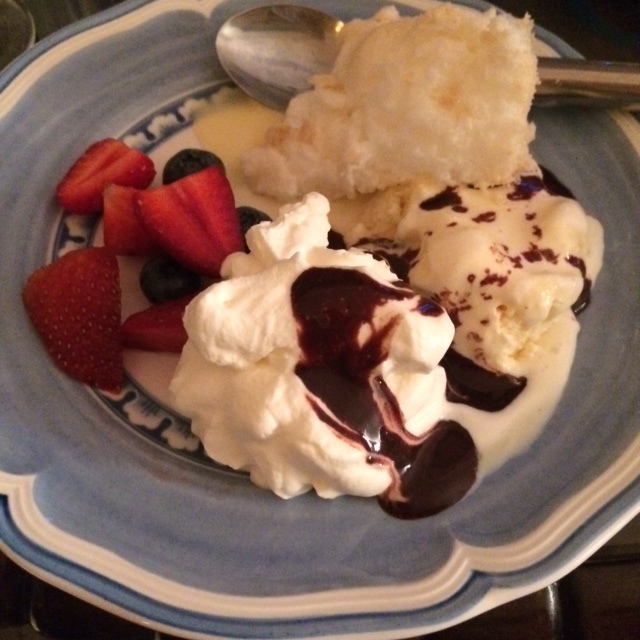 I served it with homemade vanilla ice cream, strawberries, blueberries, whipped cream and chocolate sauce. So good! The meringue is super easy to make and you don’t even need to keep an eye on the oven as you turn it off as soon as the meringue goes in. You simply forget about it and leave it in there to cook on the residual heat during the day or over night. It couldn’t be simpler. Pre-heat the oven to 225C. Beat the egg whites until very stiff. Mix the baking powder with the sugar and fold into the whipped egg whites. Pour the meringue into a buttered springform and spoon a bit of the mixture from the middle towards the sides. Place in the hot oven, turn it off and leave for a day or over night until it has set. Mix sugar, cocoa and water in a non-stick sauce pan. Bring to the boil while stirring. Add the cream and let it thicken for a few minutes, while stirring. Serve warm. This pudding is such a crowd pleaser. 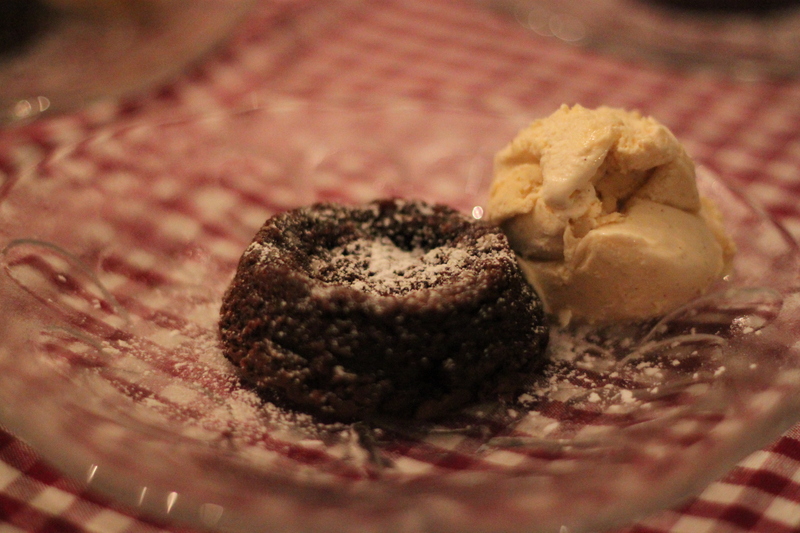 I mean, who doesn’t like a warm gooey chocolate cake with vanilla ice cream?! You can prepare the batter ahead of time, just put them in the oven half-way through the main course and they’re ready when you are. Melt the butter in a saucepan and add the chocolate pieces. Let it melt on low heat while stirring. Beat eggs and sugar until pale and fluffy and fold it into the chocolate mixture. Divide between four buttered ramekins. Bake in 175C, in the lower part of the oven for 10-15 minutes. The fondant needs to be cooked on the outside but still liquid inside. Serve with vanilla ice cream. Two New Year’s Eves in a row I’ve made the same fabulous dessert and even though i love it, it’s fun to change things up a little, so this New Year’s Eve I decided to make a Baked Alaska. 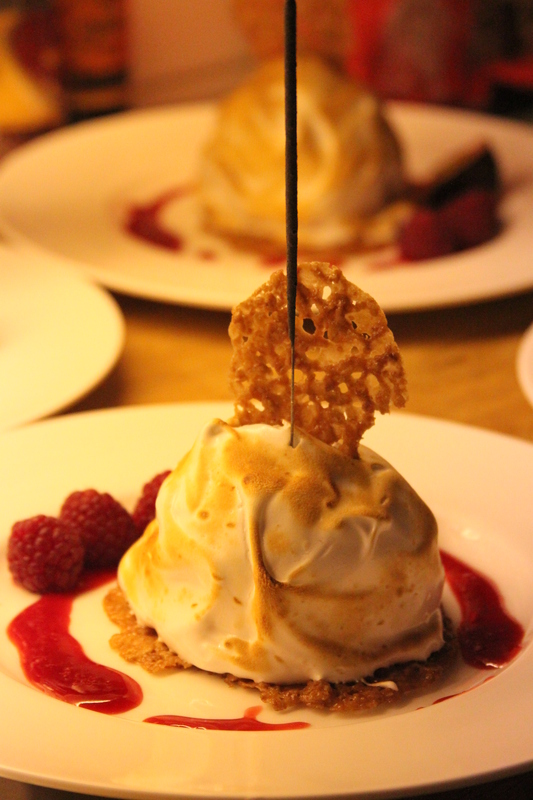 The base is oat crisps, as well as the decoration and the centre is homemade vanilla ice cream topped with passion fruit and wrapped in Italian meringue. Raspberry coulis, fresh raspberries and half a passion fruit to serve. It was delicious and looked just as impressive as I had pictured in my head. Make the oat crisps using the link above. These can be made a few day in advance, just store in an airtight container. Use a dessert spoon to measure the oat crisps for the base and half a teaspoon for the small decorative oat crisps. Still bake them for the same amount of time. Make the ice cream and divide between four ramekins lined with cling film, freeze until needed. Make the raspberry coulis: place all the ingredients in a saucepan. Bring to the boil, sieve to remove the kernels and leave to cool. Can also be made ahead of time. Make the Italian meringue: Add the egg whites and sugar in a bowl and beat for 10 minutes. Meanwhile, bring the water and sugar for the syrup to the boil in a saucepan. Pour the (very) hot syrup into the meringue mixture and beat for another 15 minutes until you have a thick, glossy meringue. Place a large oat crisp on each plate. Remove the ice cream from the ramekins and cling and place on top of the oat crisps. Scrape out the seeds from half a passion fruit on top of each ice cream block. Cover the whole lot (apart from the base) with the meringue using a spatula. Use a cream brulee torch to torch the meringue until golden brown. Decorate the plate with the raspberry coulis and fresh fruit. Top each dessert with a small oat crisp and maybe a sparkler. Serve immediately. 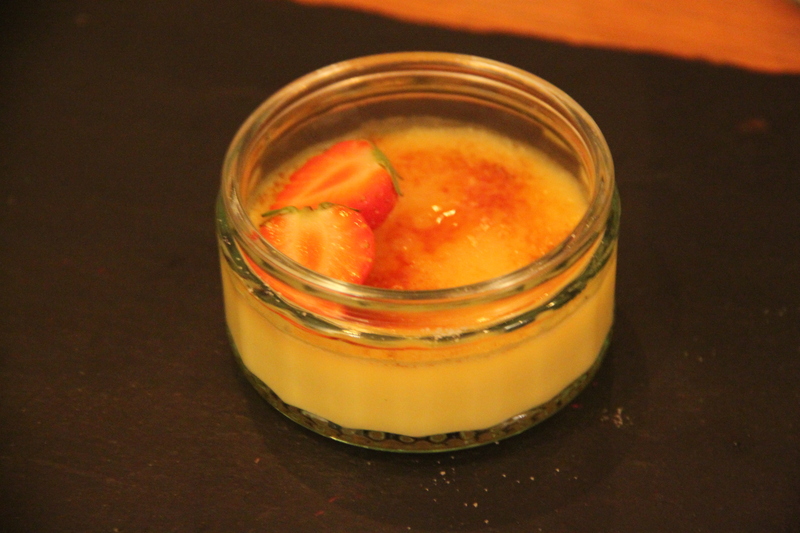 The pudding at the crayfish party was one of my favourite puddings; homemade crème brûlée. This one was flavoured with my homemade elderflower cordial and served with crispy biscotti (and some chocolates and Swedish pick ‘n mix) and went down a treat with ice-cold homemade limoncello. Bring cream, cordial and sugar to the boil, Leave to cool a little. Beat the egg yolks lightly and add first some of the cream mixture and then the rest. Divide between pots/ramekins and bake in 100C fan oven until just set, about 35-40 minutes. Leave t cool completely and keep in the fridge until serving. Before serving cover the top with a thin layer of caster sugar and use a crème brûlée burner to create a crisp sugar layer on top. Serve immediately, decorated with a strawberry, and biscotti on the side. Mix flour, baking powder and salt in a bowl. Add ground and whole almonds and sugar. Mix thoroughly and add the egg. Mix with a wooden spoon/using your hands to a smooth dough. Place on a floured surface and roll into a 28 cm long roll. Place the roll on a lined baking tray. Bake for 30 minutes in 170C oven. Leave to cool completely. Reduce the heat to 150C. Use a serrated knife to cut the biscotti into slightly diagonal slices about 1 cm wide. Place on the lined baking tray and bake for another 30 minutes, until golden and crisp. Leave to cool completely. Store in an airtight container. The first weekend in January was the last of my Christmas holiday and on the Friday we had a lovely dinner party at my parents’. It was just my parents, my best friend Emma, her husband Claes and me. And lots of food and wine, as it should be. I love that the people closest to me get on so well and that we can socialise like we’re all just old friends regardless of the age difference. 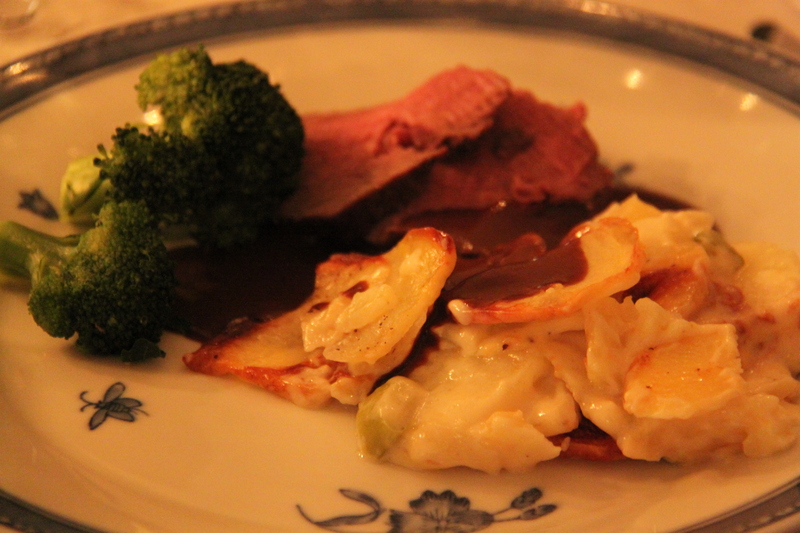 Topside of beef with dauphinoise potatoes (my mother’s version with leek and no cheese), port wine sauce and steamed broccoli. Although a complete classic I never tire of good quality beef and potatoes au gratin! 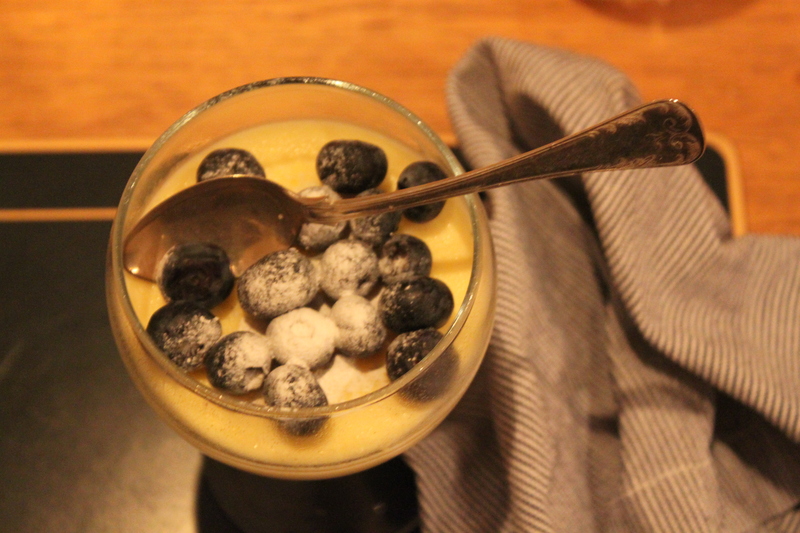 The only newish dish this evening was a wintery take on the classic Swedish dessert gino. I have no idea who invented it or when but a classic ino is like a warm fruit salad covered with white chocolate. The classic combination of fruits is banana, strawberry and kiwi but I opted for some wintery fruits instead; banana, clementine, pineapple and pomegranate seeds. This was probably even better as I prefer the pineapple and pomegranate to the kiwi. You can serve this with lightly whipped cream or vanilla ice cream but I definitely think the ice cream works best. Mix banana, clementine and pineapple in an oven-proof dish. Scatter the pomegranate seeds on top and then the chocolate. Bake in 200C oven until the chocolate has melted and browned a little. Serve with vanilla ice cream (or lightly whipped cream). 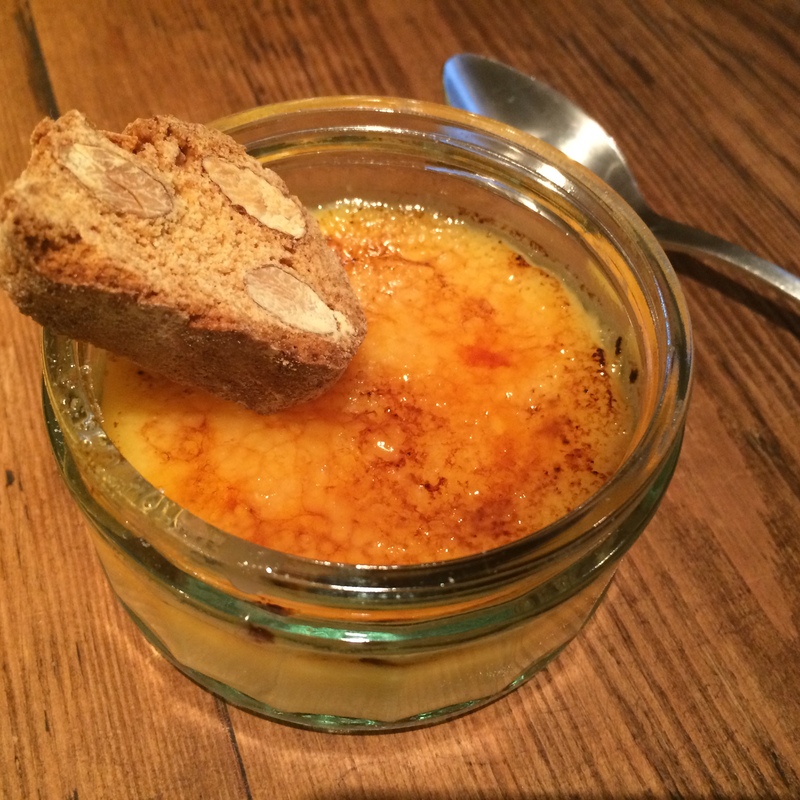 So I finally got around to trying lemon posset – this – in my mind typically British pudding. Tt is basically a pannacotta without gelatin; instead the acid in the lemon juice helps the fat in the cream to solidify so the mixture sets. 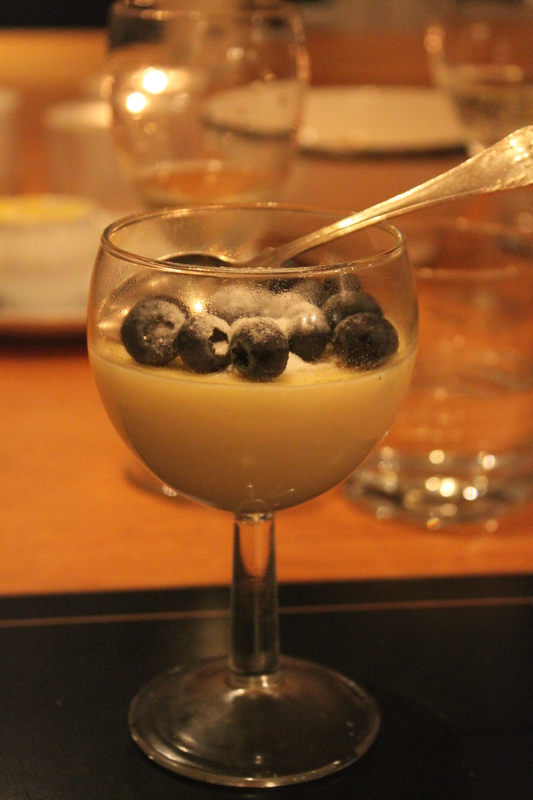 The texture is even better than that of pannacotta and the sharpness from the lemon makes the dessert feel lighter than it actually is. I served mine with blueberries for added freshness but Tom Kerridge’s fennel biscotti seems like a divine pairing. 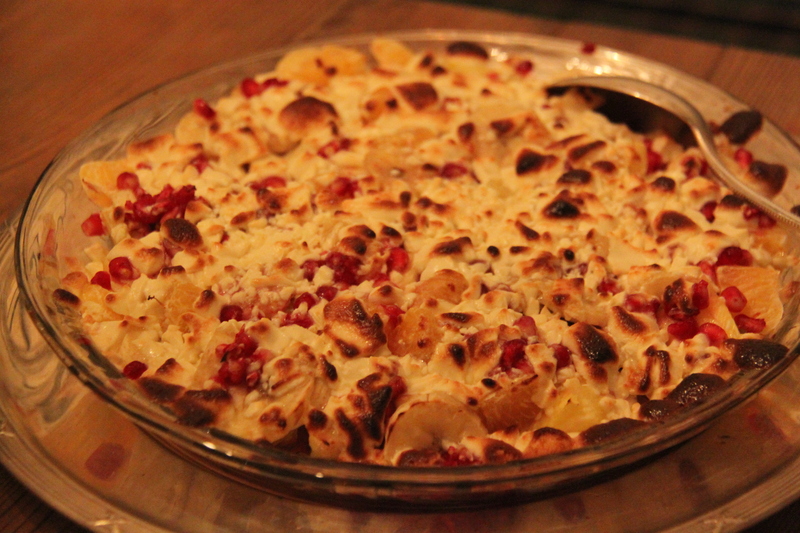 After watching his BBC series on proper pub food I completely trusted his recipe to be perfect – and it was. Bring the cream and sugar to the boil in a pan. Reduce the heat to a simmer and cook for 1-2 minutes. Add the lemon juice and mix thoroughly. Pass through a fine sieve and set aside to cool for five minutes. Skim off any air bubbles from the surface and pour into six serving glasses. Transfer to the fridge for at least two hours, or until set.